Sullen moods and mild disappointment crossed our five faces as we grabbed lunch in a cafe overlooking Resurrection Bay in Seward, Alaska. We felt like the only tourists in an empty town during the off-season, but the one tour boat was booked full. Other boat tours weren’t operating for another few weeks, and the fishing charters we queried were dormant, too. Clearly a first world problem when eating a hearty lunch and viewing arguably the most scenic landscape in North America. 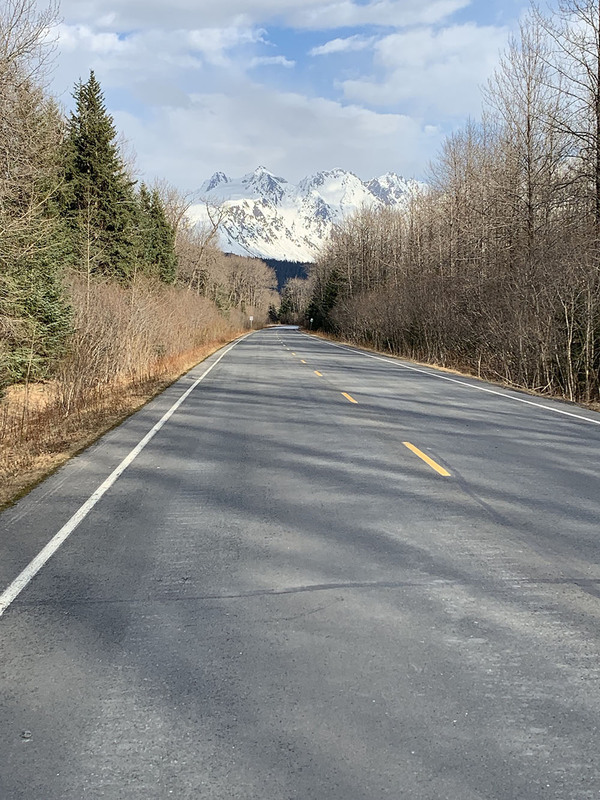 Nonetheless, we’d anticipated an epic adventure on the Kenai Peninsula on this clear, early April morning, yet with the clock closing in on noon, nothing occupied our afternoon agenda. But the Humphrey brothers, Ben and Chris, hadn’t given up. As soon as the waitress took our order, their thumbs were a blur as they searched Google via their phones for a local activity. 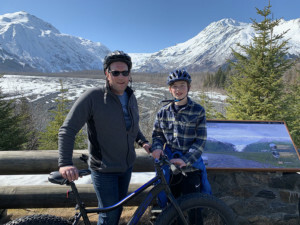 The author and his son paused at an Exit Glacier overlook before continuing on foot for an up-close visit to the glacier in Kenai Fjords National Park. Ben’s son, Austin, is a middle school buddy with my youngest son, Jameson. They’d invited us to join them on a downhill skiing dash to Alyeska Resort, overlooking Cook Inlet in the Chugach Mountains. 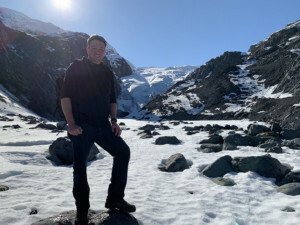 Chris Humphrey, also from the Twin Cities, had joined us in Alaska, and our quintet was enjoying the trip of a lifetime. 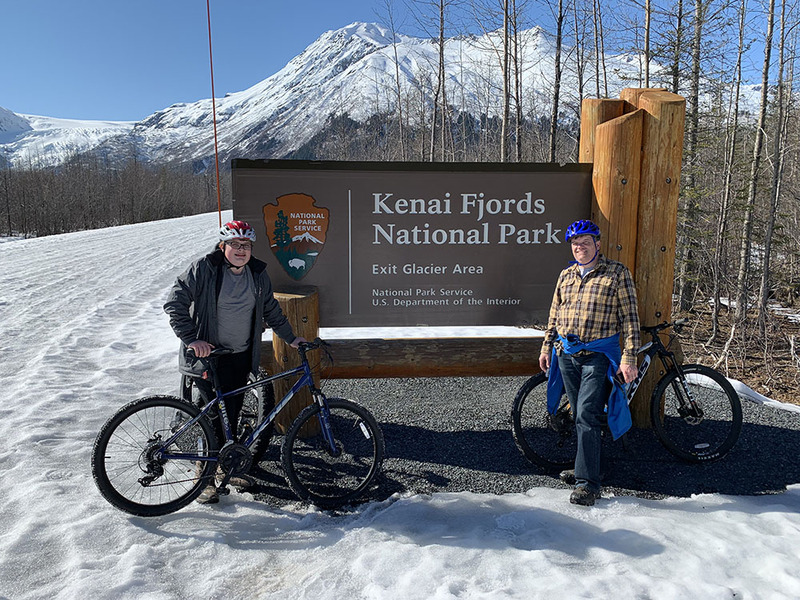 We’d eventually ski two days, but reserved a third “rest” day to explore the breathtaking mountains and coast of the Kenai. Before our burgers arrived, Ben located the owner of a nearby bike shop who agreed to rent some offroad bicycles. Though closed for the day, the shop owner (a congenial gent originally from Alexandria, Minn.) wanted to help us out since we hailed from north country. He trusted us to survive a day in the backcountry. With the park inaccessible via automobile through early spring, Austin and Ben Humphrey of Eden Prairie, Minn., obtained this trophy shot after a 9-mile bike ride. Our plan? Cruise back up the highway a couple miles to the road leading to Exit Glacier, an accessible portion of the Kenai Fjords National Park. Though a gate had closed the Herman Leirer/Exit Glacier Road to automobiles through spring, we figured thick-tired bikes could handle the partially snow- and ice-covered roadway, then we’d hike the final leg. The shop owner allowed us to load the bikes in our rental mini van, then left a locking cable for us to secure them at day’s end. 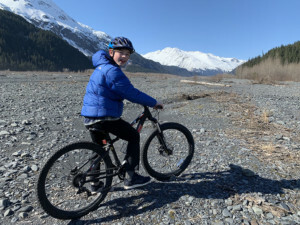 We had space for two bikes, which meant two shuttles six miles roundtrip for Ben, while I pedaled the fifth bike toward the trailhead. Accessing the area produced a serious calorie burn, but the upside was having tens of thousands of pristine public land acres all to ourselves. 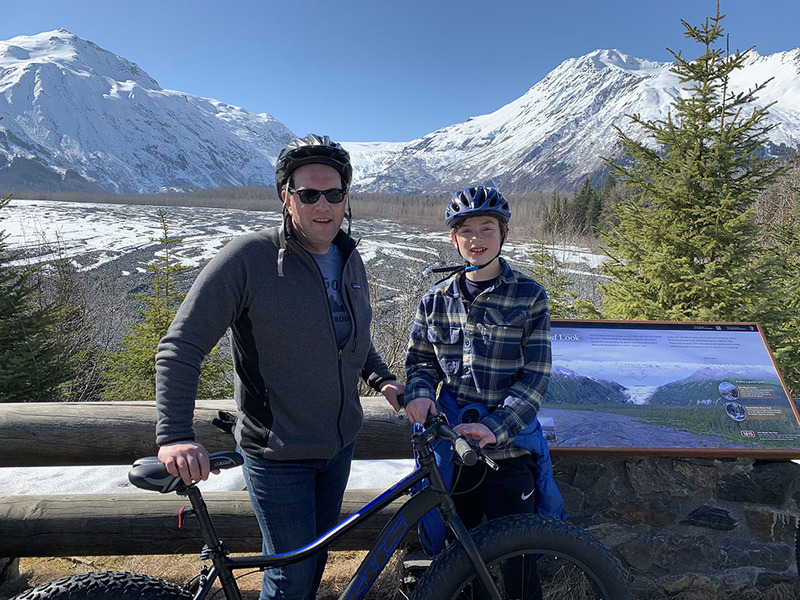 Nearly 200,000 people visit Exit Glacier each year, and during our seven-hour roundtrip, we passed four – all biking on the entrance road. The National Park Service website warns visitors that the parking lot near Exit Glacier typically fills up during the busy season, but the author’s party had the area to themselves. Pedaling generally uphill as we entered the park, a picture postcard image greeted us around every bend. Unlike a summer trip when most people visit the area, heavy snow still covered the sparkling peaks in the Chugach National Forest surrounding us. More than a mile from the visitor center and parking lot, the road became un-bikable, so we walked the two-wheelers. 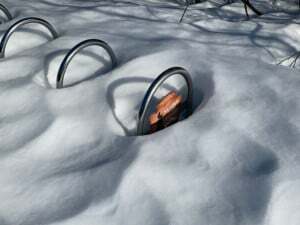 That’s a great idea for a couple hundred yards, then becomes serious work, especially when plowing through wet snow. 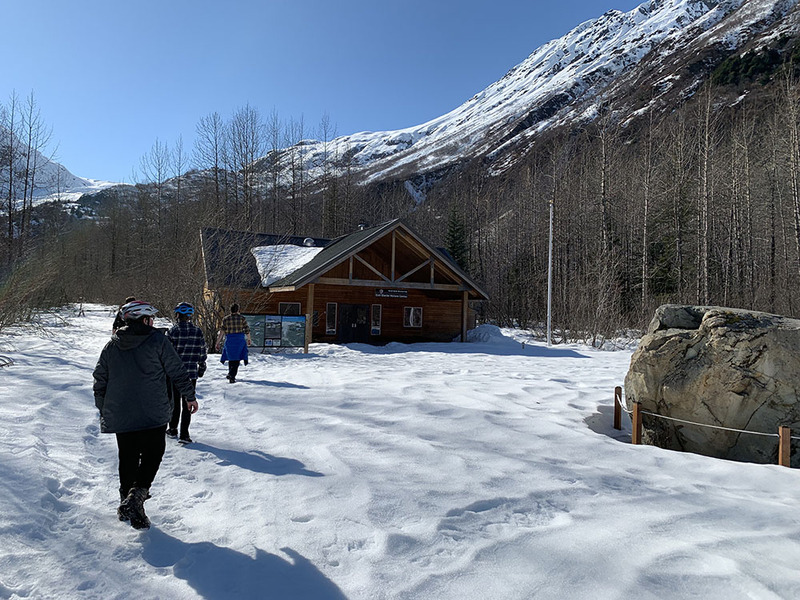 Signage along the entrance road and walkway to the foot of the glacier began providing a timeline of its icy retreat and a case study for Alaska’s warming climate. Every couple hundred yards, we’d pass a sign with a year marking the former edge of the glacier. The first was from the mid-1800s, and the signs advanced well into the 2000s. 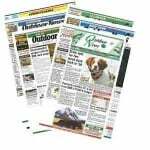 The Anchorage newspaper wrote a fine piece about the history of the glacier a couple years back that explains its retreat in excellent detail. Significantly smaller than it was even a few years ago, Exit Glacier still imposes a striking presence. 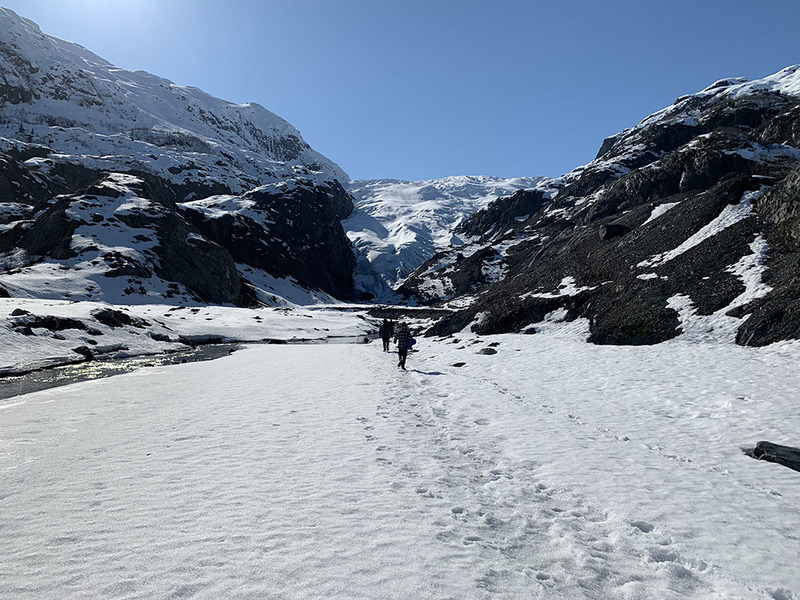 Once we reached the obviously closed-for-the-season visitor center, we had another mile hike through hip-deep snow to the glacier. My lightweight son bounced over the hard-packed snow, but I sunk to my knee every third or fourth step. Like I said, calorie-burning. En route, we passed a pavilion built in 1987 to provide a shaded view of the glacier to day hikers. Its location seemed odd since alders surrounded it, blocking the view. The Park Service hasn’t bothered to cut the alders since no one can view the retreating glacier from the pavilion anymore anyway. We’d had a fine view of what’s left of the glacier from the road, but approaching it from just a few hundred yards away was truly amazing. In an act of defiance, the group chose not to use the provided bike racks to park their bicycles. Moving closer, we skipped from rock to rock as glacial melt flowed underneath. Atop the hill above us, a sign marked 2005 revealed that, just 14 years ago, the glacier had covered the very spot where we now stood – roughly 150 yards from what remained of the glacier. A few ice patches and snowbanks aside, the group mostly had a scenic, downhill glide out of the valley and back to Seward. Because it probably will be gone in my lifetime. 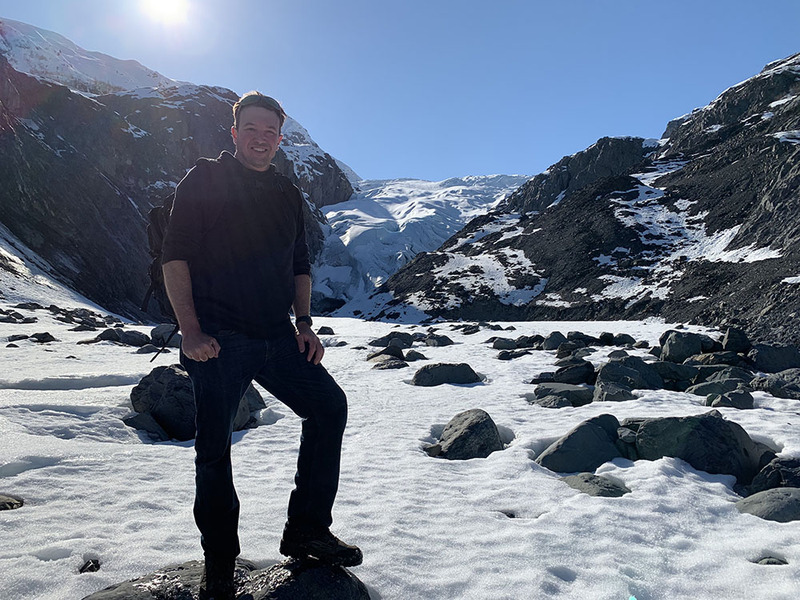 Twin Cities-area resident Chris Humphrey led the group in its final assault toward the glacier after a nearly 10-mile bike and hike trek. Running water underneath the snow eventually forced the group to turn back. The quiet, gorgeous spot deserved more exploring time, but the multi-hour journey back beckoned. On the day, we biked 16 miles over challenging terrain and walked another four to five miles roundtrip. Our one tactical error: not bringing enough water. Biking and hiking in mid-40-degree temps under bluebird skies, we sweated profusely. We should’ve known better, but thanks to Chris Humphrey’s backpack and planning, we had enough water to survive. And as soon as we returned to Seward, we downed water and Gatorade by the quart. In another month, the parking lot should be vehicle accessible. By car, the road to the Exit Glacier trailhead is roughly a 15-minute drive from Seward, which is about a 125-mile drive from Anchorage. I hope to return to the area someday, better prepared with water and gear to climb up and view the entire Harding Icefield.